Art director Richard Sheaff of Scottsdale, AZ, worked with stamp artist Kazuhiko Sano of Mill Valley, CA, to create the image based on a 1950s photograph of the entertainment icon. 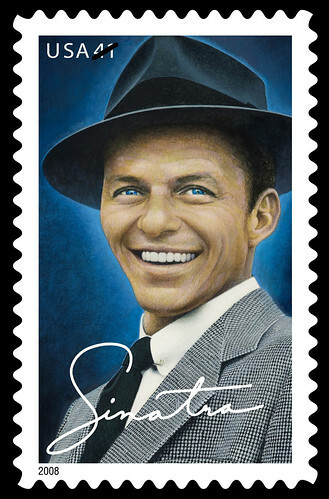 The stamp depicts Sinatra’s charismatic smile, trademark fedora and cobalt blue eyes that earned him the nickname “Ol’ Blue Eyes.” Sinatra’s autograph also appears on the stamp. In a 50-year career studded with accolades, Sinatra won several Grammys, received the Jean Hersholt Humanitarian Award in 1971, and was recognized at the Kennedy Center Honors in 1983. Sinatra gave generously to many charities and was noted for his philanthropy. President Reagan awarded him the Presidential Medal of Freedom in 1985. Sinatra was born in Hoboken, NJ, in 1915. He died in 1998 and in 2002 the Hoboken Post Office was renamed in his honor. Out of 375 inquiries from more than 40 countries, so far only a company called Odyssey Moon has completed the registration process to become an official contender, Diamandis said at a conference about space investment on Thursday in San Jose. Among the commercial possibilities of such a mission: robotically mining the surface of the moon to extract silicon that could be refined into chips to create solar arrays on the moon that would eventually – by means as yet unspecified – beam power back to Earth. Gregg Maryniak, executive director of the XPrize Foundation, began the presentation by showing a futuristic video depicting the moon as "a natural storehouse of resources that we can use to enhance life on Earth and explore our universe." Maryniak likened the Google Lunar XPrize to the Apollo challenge issued by President John F. Kennedy in 1961. "Now there’s a new moon race," Maryniak said, calling this "Moon 2.0" effort "a race to bring Earth’s offshore island, the moon, into Earth’s sphere of economic activity." Odyssey Moon’s leaders include Robert Richards, a co-founder of International Space University, and Ramin Khadem, former chief financial officer of Inmarsat, a nearly 30-year-old satellite firm publicly traded on the London Stock Exchange. Officials said the company is based on the Isle of Man to take advantage of space-friendly tax policies and regulations. This entry was posted on Wednesday, December 12th, 2007 at 5:31 pm	and is filed under Around the Blogs, Cool Stuff, Front Page, Navigation/GPS. You can follow any responses to this entry through the RSS 2.0 feed. You can leave a response, or trackback from your own site.